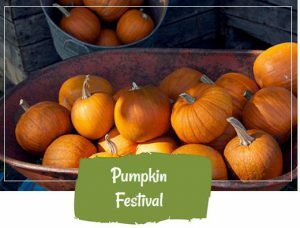 If you are looking for clean, wholesome harvest fun, fresh produce and great memories then you will love our Pumpkin Festival with a large variety of activities that all ages will enjoy. There is so much to do that most families plan to spend 3-5 hours at the farm. We’ve got lots of autumn decorative items, colored corn stalk bundles, mini pumpkins and beautiful colored corn. The sunflowers are ready to be cut. Lots of sizes and colors of Pumpkins. We are open daily through the end of October, daylight hours. The Kiddie Korn Maze is looking good. Hope to see you soon. Note: cash transactions, only. Contact Denise Christopherson at 509-430-2167 for more information. Includes: hay ride to pumpkin patch, 3-acre corn maze, petting zoo, straw-bale maze, straw-bale pyramids, old-fashioned carnival rides, and, on weekends, a family photo in the photo booth, a free face painting & the bounce house obstacle course. Note: pumpkins sold separately, carnival rides & treats – tickets sold separately. It’s time to dress up your front porch for Fall! Our pumpkins and squash are ready and waiting to be picked. 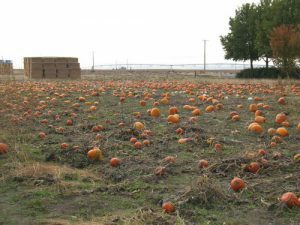 Pumpkins are 20 cents per pound and specialties at 35 cents per pound. – Wear closed toe shoes and shoes you can get dirty. – Bring a pair of gloves the vines and stems can be prickly. – Bring a pair of garden clippers to clip the vine from the stems. – Leave the stem on the pumpkins. This is important because this will give the pumpkin a long shelf life. – Cash or check, only. No credit cards accepted. U-Pick Pumpkin Patch full of pumpkins for carving, painting, and decorations as well as a selection of winter squashes to eat. All pumpkins and squash are 30 cents per pound. No entry fee to enter the patch. – Nursery Tour Hayride – A 15 minute ride on our 36 acre nursery full of Halloween fun, peacock sightings and a little tree humor. Price is $3 per rider over 3 years old. Hours: Friday from 6 p.m. – 10 p.m., Saturday from 10 a.m. – 10 p.m., Sunday from 10 a.m. – 6 p.m.
Pumpkin sales: Tuesday-Sunday from 9 a.m. – 5 p.m.
We Love Pets but please leave your pets at home, we have strict insurance rules regarding pets. 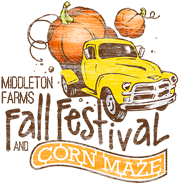 Monday – Thursday from 3 p.m. – 9 p.m.
Friday from 4 p.m. – 10 p.m.
Saturday from 10 a.m. – 10 p.m.
Sunday from Noon – 7 p.m.
We are celebrating our 20th Anniversary of corn maze fun this year!!! Come on out and visit us at the corner of Rd. 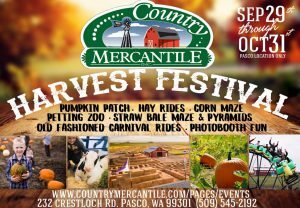 68 & Argent in Pasco to get lost in the maze, take a ride on the Cow Train, and enjoy our “barnyard” activities. 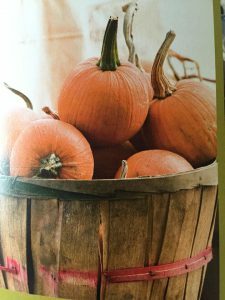 And don’t forget to grab a pumpkin or two and some cornstalks to decorate your porch, and some farm fresh apples for your fall baking. – Wednesday & Thursday: 4:00 p.m. – 9:30 p.m.
– Friday: 11 a.m. – 11 p.m.
– Saturday: 11 a.m. – 11 p.m.
– Sunday: 11 a.m. – 5:00 p.m.
Family friendly corn maze and pumpkin patch with fun for all. Admission includes unlimited access to our 12 acre maze, unlimited hay rides, and use of the public fire pits. Kids 10 and under can run through our straw maze and spend hours of fun on our straw pyramid and slide, in addition to access to our kids corn maze which is never haunted. The big maze is haunted Wednesday through Saturday night starting at 7 p.m. Showing two outdoor scary movies: 7 p.m. will feature a PG film and 9 p.m. will feature a PG-13 film. Movie free with general admission. 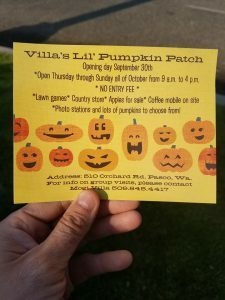 Open Thursday through Sunday from 9 a.m. – 4 p.m.
Visit Villa’s Lil’ Pumpkin Patch! 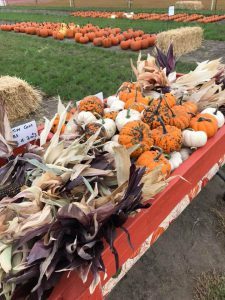 We have lawn games, country store, mobile coffee stand, hay stack pyramid, photo stations, and lot’s of pumpkins to choose from. 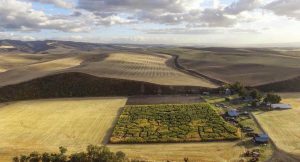 The Walla Walla Corn Maze is located at 853 Five Mile Rd. in Walla Walla. Bring your flashlight and be aware there is poor cell phone reception. Concession stand and portable restrooms are also available. Thursdays: 6 p.m. to 10 p.m.
Fridays: 6 p.m. to 11 p.m.
Saturdays: 2 p.m. to 11 p.m.
Sundays: 4 p.m. to 9 p.m. Admission: $8 ages 12 years and older, $5 ages 4 years to 11 years (must be accompanied by someone 16 years or older), 3 years or under free (must be with parent or guardian). 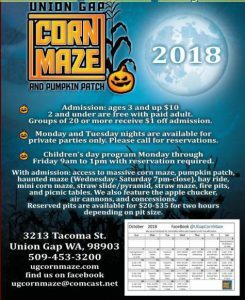 There will be a Halloween Spooktacular when the corn maze will be scary on October 18-21, 25-28 and 30 & 31 that begins at dark – $10 per trip all ages. Parental discretion required for children under 12. Dates: October 5, 6, 12, 13, 19, 20, 26, 27 from 7 p.m. – 11 p.m. The Pasco Jaycees are promoting their haunted forest again this year at Sacajawea State Park in Pasco. Note: you will need to park at the Port of Pasco where shuttle service will take you to the entrance. Dress warmly and wear comfortable shoes. Hours: Thursdays 7 p.m. – 10 p.m., Friday & Saturday’s & Halloween 7 p.m. – 11 p.m. Kids Day: October 13 and 27 from 1 p.m. to 4 p.m.
– Scaregrounds Pass – $15 Allows you one trip through the haunt. – Scaregrounds Fastpass – $30 gets you to the front of the line – 1 time through. – Kids Day Tickets – We have two kid-friendly days on Oct 13 & 27. Tickets are $5 and will be on sale at the box office starting at 12:30 p.m. on Kids Day. Note: $5 off discount vouchers available at Tri-Cities Dickey’s Barbecue Pit Locations (redeemable on Thursday nights only). 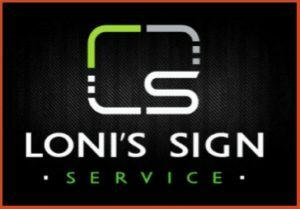 You’ll enter through the Loni’s Sign Service Graveyard then step in to our world! Line times vary per night depending on how many people are enjoying the Scaregrounds. To beat the lines, come early and plan to stay all night. The fastpass is another way to skip the line and go right to the front. – Age Restrictions: The Scaregrounds in normal operation is rated PG-13. – Entrance to the Scaregrounds: All On-Line Tickets MUST Be exchanged at the Fairgrounds Gate for a Haunt Boarding Pass corresponding with the ticket(s) purchased. No one will be admitted to the Scaregrounds who is Drunk, Impaired on Drugs, wearing a Mask, has a simulated weapon or is deemed a security risk. No Guns or Weapons! 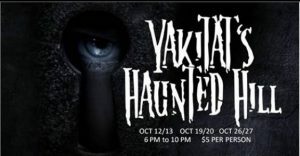 Dates: October 12, 13, 19, 20, 26 & 27 from 6:00 p.m. until 10:00 p.m.
We are a haunted house and haunted hill that is put on with the help of the Kiona Benton Highschoolers and their parents. Our haunted house is a winding maze of differently themed areas with sounds, blacklights, moving props, and scarers throughout. Your journey will continue to our haunted hill portion of a haunted hunt for urban legends. Afterwards take a stroll on the front field where we will have our vendors and have some food or do some shopping. We will have decor, artisan crafts, and products. Money raised goes to the kids parent groups to pay for senior gifts/trips. Please join us for a unique experience and night of fun! Find us on Facebook for details.